I have found that it is often small things that can make all the difference in how user-friendly our myEvolv processes are. 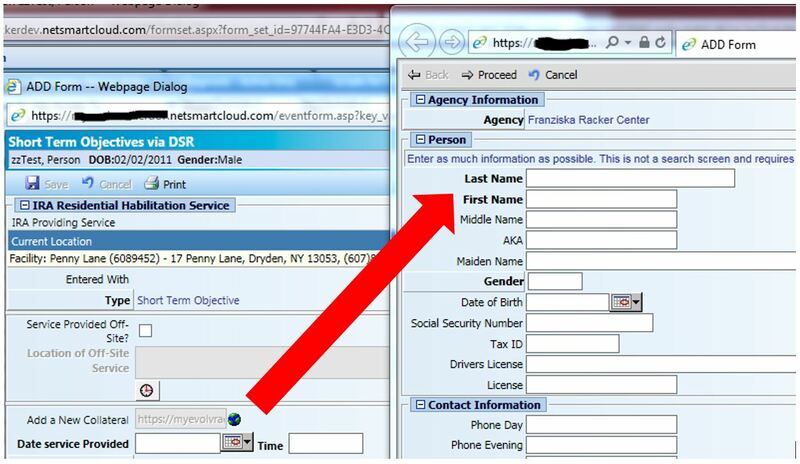 One problem that we ran into with myEvolv was that if you were in the middle of working with a form where you needed to select, say, a collateral but that collateral had not yet been added for the client, you would need to save the form as a draft (if allowed), navigate to the collaterals formset member to add one and then return to the original form to select the collateral. If you have experienced this, then you know how annoying it can be. My solution to this issue was to add urls to our forms that would launch the collaterals wizard without the need to close the form at all. Users are then able to add collaterals on the fly. This could be used for other relationships like health providers or families and possibly even things outside of the relationships formset. 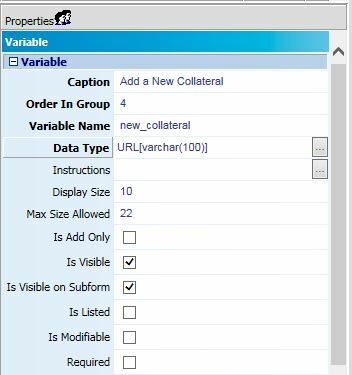 This post will demonstrate how to create a URL form variable to launch the collaterals wizard but you should be able to apply the same steps to other formset members and achieve the same results. 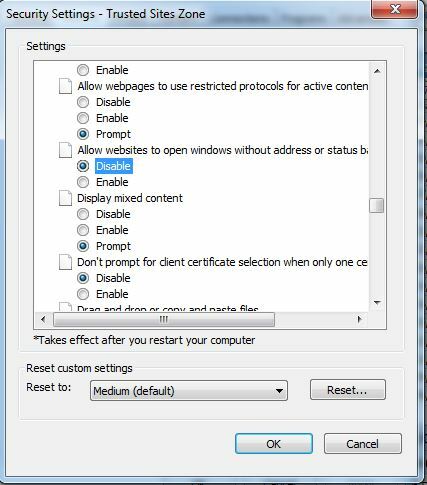 With this setting disabled, you will now see the URL for all popups that myEvolv creates. See the image below for the before (top) and after (bottom). What’s in a myEvolv URL? We want to keep this URL the same as much as we can but there are some variables we need to identify in here so that we can generate a unique URL for each form instance based on whose client record we are working on. If I just dumped this URL onto a form statically, I would always be creating collaterals for the client whose record I had open when I grabbed this URL along with some other problems. The parts we need to examine more closely are anything with a GUID. event_id does not need to be changed. I am not sure what it is but the value stays the same no matter which client record so its safe to bet you can keep it static. On your form, insert a new variable wherever you want it to display on your form. You can name the variable whatever you would like and caption it however you would like. I typically make the field not modifiable so that users can’t make changes to the url that might have an adverse effect. You might also want to shorten the display length so that it looks better on the form. We then need to concentrate on generating the URL string that will be our default value for this variable. For those of you who have not done URL string building, it just involves a lot of string concatenation. We first create a variable and assign it a string value that is equal to the first chunk of static text. Then we concatenate our first variable. Then concatenate the next chunk of string that is static and so on until we have our full url. You can see the results of your concatenation in the URL variable on the form so if you keep it modifiable and give yourself a generous display size, you can check to see where you might have left pieces out by mistake. 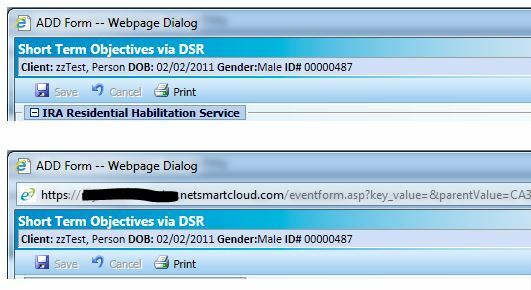 If you built your URL string correctly, you should launch the Add Collateral window from your form. One thing I have noticed is that after you fill out the form and hit save, the form does not close or give any indication that the collateral had been added successfully. One challenge in getting the form to behave any different is that these forms are system not-modifiable so we don’t have the ability to go in and add a window.closeAfterSave = true snippet to them. Users must be trained to close the window manually after they have saved the form without triggering an error for things like blank required fields.